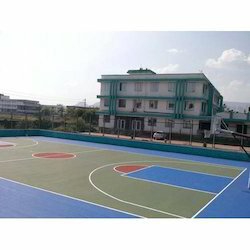 Our product range includes a wide range of tennis court synthetic flooring, volley ball court synthetic flooring, basketball court synthetic flooring and multipurpose court synthetic flooring. We with immense industry experience are engaged in offering Tennis Court Synthetic Flooring that includes flexible coats with wear resistance that provides an optimal comfort to the player by absorbing the shock waves. This can be availed at leading market rates and an assistance if required in terms of how and why requirements in the servicing. 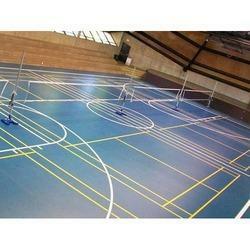 We are offering Volley Ball Court Synthetic Flooring . Our professionals finish these services by using the advanced techniques. We complete this service in many forms as per the necessities and demands of the patrons. With the help of skillful professionals, we render this service as per the requirements of our patrons in an effective way. We are offering Basketball Court Synthetic Flooring . We keep proficiency in offering this service with high efficiency. These are accomplished under the headships of extremely qualified and skillful experts who have prosperous industry practice. to our valued customers. To fulfill the requirement of a spacious hall for different activities, great manufacturers have come up with ideas that will serve various purposes together. 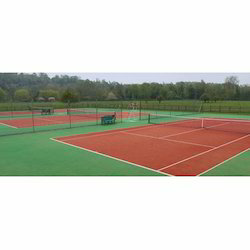 The multipurpose court fulfills each requirement with equal proficiency cutting out the cost to a great extent. The synthetic flooring of the multipurpose court makes the area durable with the least maintenance cost. The quality of synthetic that is used for the synthetic surface of a multipurpose court is chosen such a way that performers and players have least chances of accidents.